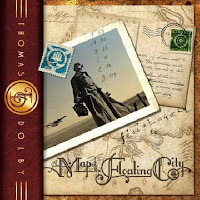 JP's Music Blog: CD Review: Thomas Dolby Gives Us "A Map Of The Floating City"
CD Review: Thomas Dolby Gives Us "A Map Of The Floating City"
Singer, songwriter, inventor, entrepreneur, and even '80s pop superstar are just some of the words to describe Thomas Dolby. Known mostly for his smash hit "She Blinded Me With Science," Dolby left the music scene in the early 1990s. During his time away, he became an inventor and started his own tech company, Beatnick Inc. After retiring from the company, Dolby decided to take-up his musical hobby once again and began writing songs on his 1930s lifeboat which he converted into a renewable energy-powered studio. 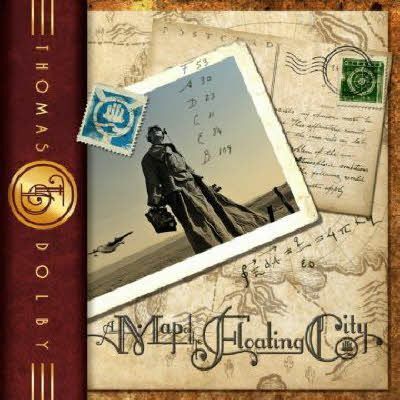 Now, after 20 years, Thomas Dolby breaks his musical silence with his brand-new studio album entitled "A Map Of The Floating City." The album is broken up into three parts; Urbanoia, Amerikana, and Oceanea. Each part represents a different musical style that peaked Dolby's musical curiosity. The first part, "Urbanoia" carries a very electronic sound, especially the dance-floor beats of "Spice Train," but he counters that with the jazz vibe of "Jealous Thing Called Love." The second part entitled "Amerikana" caries a more country, folk rock sound. These are by far my four favorite songs on the album. His voice and song-writing just plays out perfectly on "Road To Reno." Dolby receives some help from friends and fellow musicians like guitarist Mark Knopfler on the 7-plus minute "17 Hills." Dolby seems to end each section with a mellow jazz piece as he does here with "Love Is A Loaded Pistol." The third section begins with "Oceana" with Scottish singer Eddi Reader taking the lead vocals on this eclectic piano piece. Dolby keeps the jazz sound around in the Caribbean flavored "Simone" before finishing the album with the dark mix of acoustic and electric guitar driven "In The Lifeboats," which allows Dolby to express himself. The new album will be released on October 25 through Lost Toy People Records. Thomas Dolby is also supporting the album with a mini-tour that begins in Washington, DC on October 3rd. The show will consist of a lecture about the stories behind the songs on his new album and then a performance by Thomas Dolby featuring his new music. For tour dates and album information, please visit thomasdolby.com.